Today in History–December 10–the Library of Congress features baseball player Walter Johnson, who died on this day in 1946. Johnson played 21 seasons with the Washington Senators and later became the team’s manager. 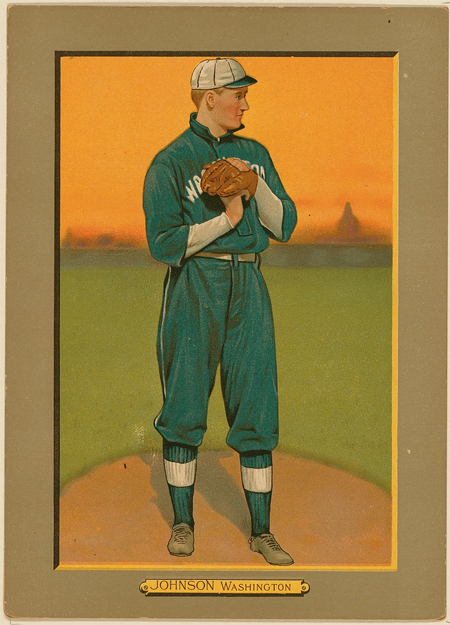 Nicknamed “The Big Train”, Johnson is considered to have one of the best fastball pitchers ever. His accomplishments include the following: scored more shutout victories (110) than any other major league pitcher; set a record in 1913 pitching most consecutive scoreless innings—56 (held until 1968); racked up an all-time strikeout record of 3,508 (held until 1983); second in all-time wins (follows Cy Young); among the first players to be elected to the National Baseball Hall of Fame (1936). Learn more about this maven on the mound by visiting the Today in History section, then click the links below to see and read more.